This dye pot is to beautiful to simmer! 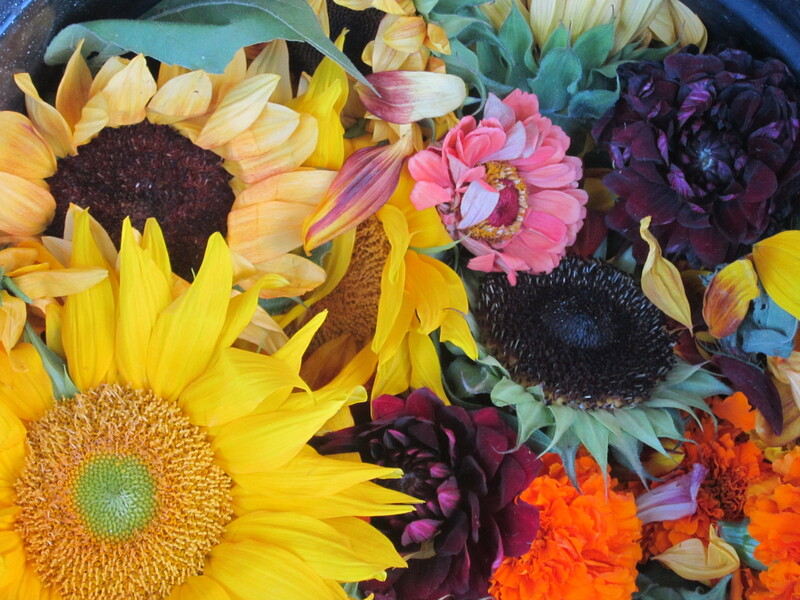 A collection of summer flowers- sunflowers, marigolds, dahlias and zinnias. Thanks to Carolyn Snell of Snell Family Farm for contributing flowers that were just a bit past their prime. Perfect for the dye pot. Carolyn grows an amazing array of cut flowers. You can see them at the Portland Farmers Market on Wednesdays and Saturdays or at Snell Family Farm in Buxton. We are so grateful for all the support we have received since nominating ourselves in The Martha Stewart American Made contest. We would love to be finalists, so we are asking again, if you would be so kind to follow the link below and share our profile on Facebook. Shares matter! 212 shares and counting! The more social shares on Facebook and Twitter, the better the maker’s chances of earning one of our 200 wild-card finalist spots for grand-prize consideration. This entry was posted in Naturally Dyed Yarns and Products and tagged Agriculture and Forestry, alpaca, Alpaca fiber, Camelids, Dye, farm, farming, fiber art, fiber arts, hand spun, knitting, Maine, Natural fiber, naturally dyed, plant dyes, spin, wool, yarn. Bookmark the permalink. ← The lambs are growing!